As the world drifts increasingly into dark waters, the peoples of the world's great democracies cry out to the heavens, beseeching someone to do something to make it all safe again. Usually the someone is a politician, a leader of virtue and a beacon of hope, upon whose powerful shoulders we can place our burden and rest our fondest wishes. But politicians today are accustomed to doing their work by doing nothing. They have graven on their hearts the mantra let it be and so they do. But when a ship is listing alarmingly to port, it is no time for the captain to be standing by and letting things be; the crew expects commands, directions, at the very least some helpful suggestions as to which ropes to pull and which sails to hoist. It is one thing to have one's hands off the tiller when the sailing is smooth, quite another when the waters are rough. And so we turn to the politicians to do something, to guide us through the rough waters to a haven, sweet and gentle. Which, all things considered, the politicians seem to find rather a dashed nuisance. 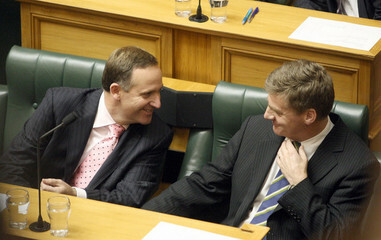 John Key and Bill English chuckle at the thought that they might actually do something. Out of dubious nostalgia and unrelenting despair, we look back to the golden age of the post-war years—the years of innocence and ease, luxury and contentment—and ask ourselves what it was that our wise leaders did then that the leaders of today are failing to do. For it is obvious, we think, that the good times came about through wisdom and forethought, sound planning and rational analysis. The notion that the good times might have been little more than a serendipitous turn for the better, jollied along by a cracking good world war, does not tend to cross the minds of most; and if it does have the temerity to do so, usually at some ungodly hour when we are most vulnerable to unsettling thoughts, we muster all our mental forces to turn it out and send it packing, for it is no use to us. Our faith in reason and the ability of our leaders to work things out, it must never waver, for it is all we have left us.